Choosing the right fabric is always important. A curtain with cotton panel allows the optimum passage of light is making it suitable for drawing rooms. 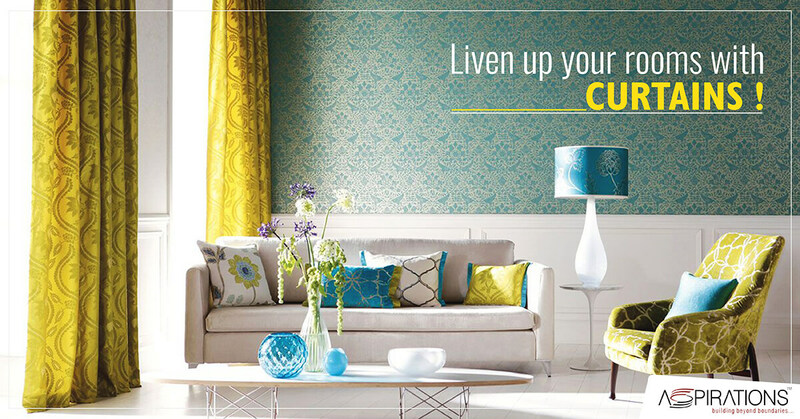 Cotton curtains add energy to your rooms. While linen dissipates light making them obtuse and can be installed in bedrooms. The visible creases of the linen-made curtains stand most appealing to the viewers’ eyes. Curtains made of blending like silk and linen are often artistic as it captures both the wrinkle of linen and the seamlessness of silk. If you are thinking of ordering one of the apartments for sale in Kolkata, a correct choice can better manufacture your dream. You have often thought of changing the interior of your room but also have thought about the probable expenses. Using curtains to improve the look of rooms is always a preferable option. As recolouring walls might stand expensive, curtains with elegant looks come handy both with its aesthetic appeal and durability. If you are thinking of renovating your rooms while at your stay with Aspirations residential complex in Kolkata get acquainted with the colour, style or fabrics of curtains. Moving beyond the beatification, curtains with block-out mechanism tend to avoid the loss of heat during winters and block out the excess of temperature during summer from infiltrating in. Such curtains are also beneficial for a good night’s sleep and your child’s room. Using multiple layers of the curtain can block out sound too and can be used for living rooms. Curtains have an intrinsic property of providing you with a sense of privacy and intimacy. Rooms that can be viewed from outside can be blocked by using curtains. The luxury of curtains can also add romance to your bedroom and spice up every conversation across your living room. As you choose Aspirations as the best real estate developers in Kolkata, nourish your wish of living in a luxurious dream with exotic décor and search the meaning of life.